Today, I'm thrilled to turn my blog over to Science Fiction and Fantasy author, David N. Sebastian. He's here to talk about his new release, INFINITAS, a teen high fantasy adventure geared toward middle grade children. I know 'David' in another genre. I'm going to step aside and allow David to tell you a little about himself and why he decided to change genres. He is also here to tell us about a new promotional venture called Kindle Scouts he is using to get the word out about INFINITAS. Many thanks to Nancy for having me on her blog today! David N. Sebastian is a pseudonym for a published romance author (...shhhhhh...) - whose name will remain a mystery! But when my thirteen year old son begged me to write him a book, INFINITAS was the result. I really wasn't sure if my romance writing skills were transferrable to the teen fantasy genre, but I'm proud of the end result. For centuries, the world of Aeon has been oppressed by a great evil. Prophecy spoke of a chosen one who brings an end to the evil, yet on that day were born two. Kali and Drake - cousins and warriors. Embracing their fates, they embark on a perilous journey, battling forces of nature and magic, calling forth their courage to conquer not only evil but an even greater enemy. Fear. From a woodland village to the stone keep of Infinitas, only one thing is certain. Destiny Is an Adventure. In order to get INFINITAS into the hands of my young readers, I'm testing the waters in a new publishing adventure. Have you ever heard of KindleScout? I hadn't either. It's a relatively new reader-powered publishing program where readers help discover the next great books in four main genres: Romance, Science Fiction & Fantasy, Literature & Fiction, and Mystery & Thriller. Authors / stories are chosen by KindleScout to be presented on their website for a one month campaign and readers vote for their favorite stories based on the book cover, blurb and first 5,000 words of the story. It's that simple. Readers are allowed three votes per month. And the greatest part is that if a book chosen by a reader is selected for publication, the reader receives a free copy at time of publication. 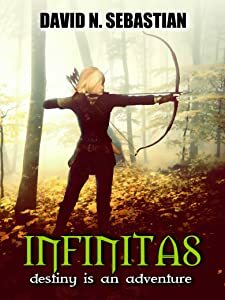 Please come check out this new addition to the KindleScout website called INFINITAS by David N. Sebastian, a teen high fantasy adventure geared toward middle grade children. Thanks for taking the time to read the blurb and please vote if you loved the entry. David, again, it was great having you here today. I just placed my first vote for INFINITAS. It's super easy and it really does only take a moment of my time. If anyone has any questions for David N. Sebastian about INFINITAS, Kindlescout or anything at all, please don't hesitate to leave a comment below. If you can't get the comment section to work, you can always leave a post on my Facebook Author Page or Twitter. I will respond to your comments because I love hearing from my readers. Have a wonderful week, and as always, be kind to one another.